This is a picture of the Kilgen theater console in the Burien mansion near Seattle. I was asked to visit a mansion just outside of Seattle that has been literally grown over with vegetation. There are no roads to the place and one must hike into the property on foot. The house is exquisite! 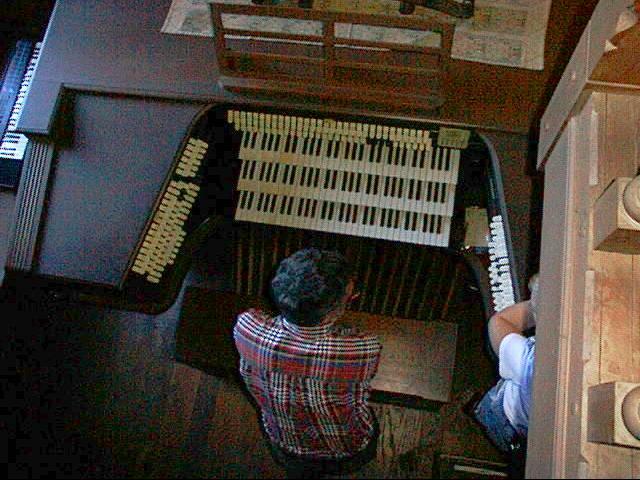 Upon entering the house I found myself standing on a landing overlooking a formal ballroom complete with two 9' grand pianos, a grandfather's clock 10' tall, a fireplace the size of my bedroom and last but not least, the largest Kilgen Theater organ I have ever seen. My friend took this picture of the console which stands at the opposite end of the room from the fireplace. The console measured approximately 6' deep. Along one side of the ballroom is diamond shaped cut leaded windows from floor to ceiling over looking the Puget Sound and on the opposite wall up near the ceiling are the shutters for the organ which run the full length of the room. Behind the console and upstairs there is a library full of priceless books. This library has wooden grates in the floor which provide sound from the organ's separate "library" division to fill the reading room with music. According to one contractor, it would take $800,000 to restore the home. Even without restoration, the magnificence of this once thriving homestead remains evident with little stretch of the imagination. The family who now ownes the property have been trying to sell. Now they are trying to find means to restore the grounds as a historical site via grants and interested individuals.